The most comprehensive special issue on Immunooncology biomarkers is out ! 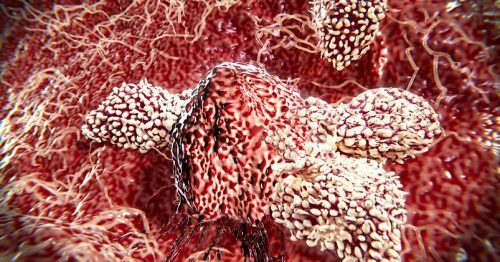 The International Immuno-Oncology Biomarker Working group has released the most comprehensive special issue on immunooncology and biomarkers. Because open science is important to us, the 27 articles of this issue will be freely available to everyone for 3 months, so don’t wait to download here. 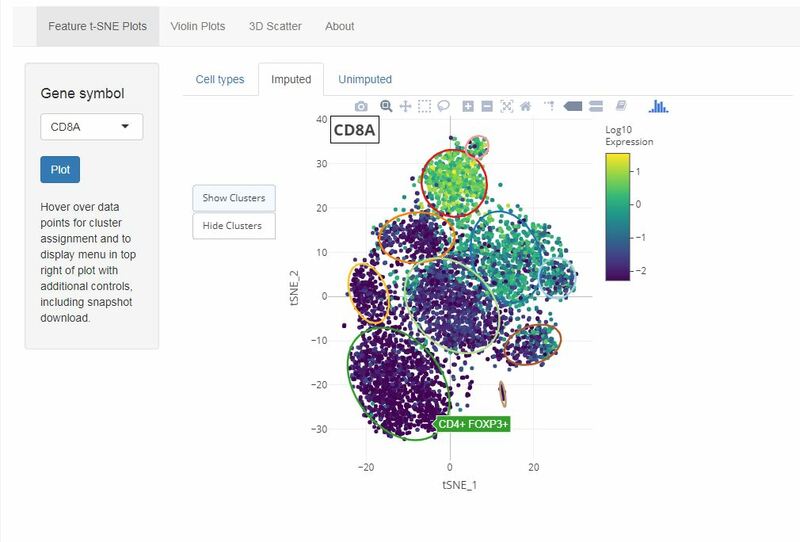 An interactive application for exploring single cell 3′ mRNA-seq of breast cancer TILs can be found here. For more information regarding this data, see the related publication Savas P, Virassamy B et al. Nature Medicine 2018. When referencing the data displayed in the application, please cite the aforementioned paper. 1. Follow the link to the application https://bctils.net/. It may take up to a minute to load. The page will display a visualisation of the different clusters detected amongst the TILs. Hover over individual points to see the cluster assignment. 2. Type the symbol for your gene of interest in the drop down box under ‘Gene symbol’. If you wait a moment, a list of possible genes will appear as you type. If your gene does not appear in this list, then there is no data for that gene, or an alternate symbol is used. Gene symbols are taken from the Ensembl gene models, release 79. 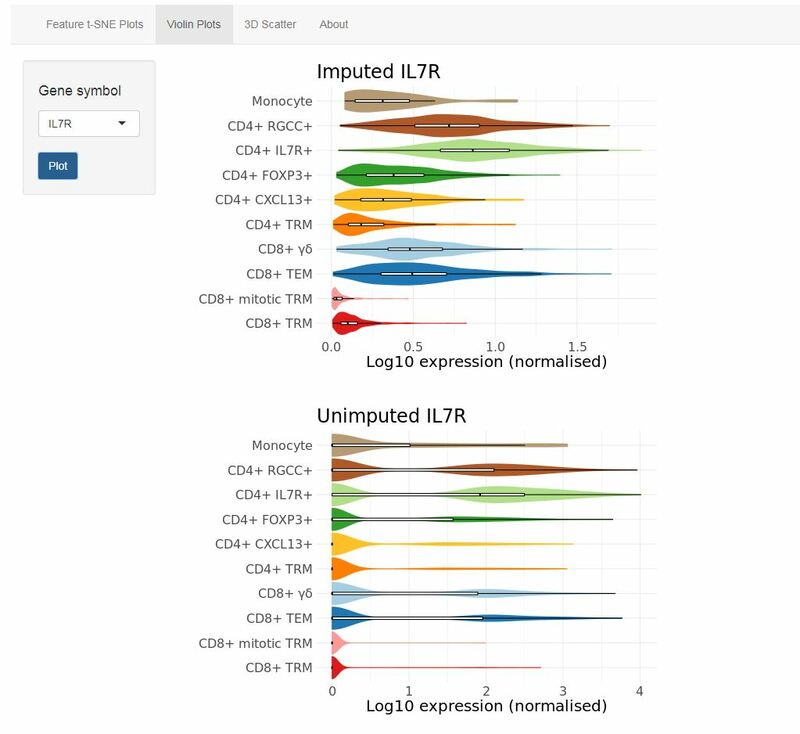 To plot the expression level of your gene in each cell, click the ‘Plot’ button. By default imputed data will be shown, but unimputed data can be shown by clicking on the ‘Unimputed’ tab above the plot. You can show or hide the cluster outlines with the buttons on the left. Hovering over data points will show the cluster assignment. To download an image of the plot, hover over the plot with the mouse and click the small camera icon at the top. 3. To see summary violin plots of gene expression for a given gene in the different clusters, click on ‘Violin Plots’ in the grey menu bar. To download an image of the plot, right click (Windows) or ctrl-click (Mac) on it and ‘Save image as’. 4. 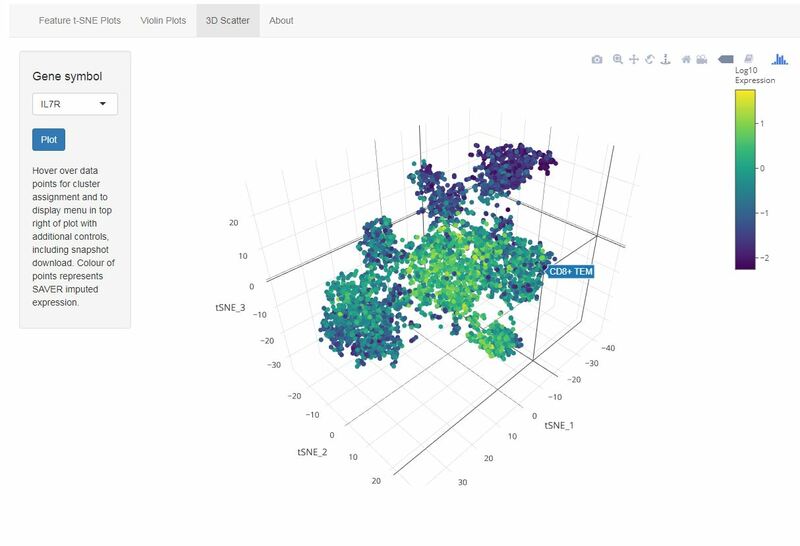 To see a 3D visualisation of single cell gene expression, click on ‘3D Scatter’ in the grey menu bar. 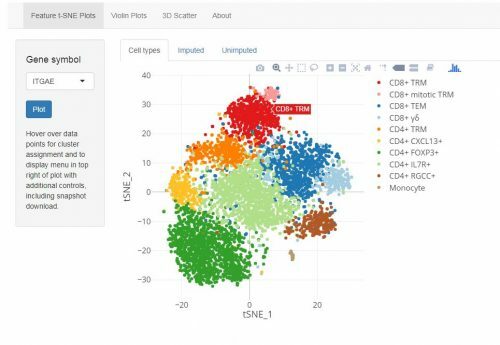 Find your gene of interest using the drop down box and click ‘Plot’. To rotate the plot click on it and drag, and use the mouse wheel to zoom in or out. Hover over the plot to see the cluster assignment. While hovering, click the small camera icon at the top to download an image, and click the small home icon to reset the view if needed.